With lakeside promenades, fancy boutiques, and plenty of sunshine, Lugano is an inviting place to take a break from your trip. A mountain view over Lugano is beautiful at twilight. 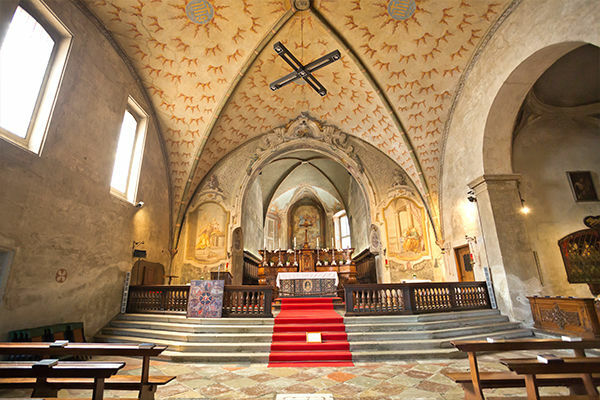 Lugano's best frescoes are inside the Church of St. Mary of the Angels. 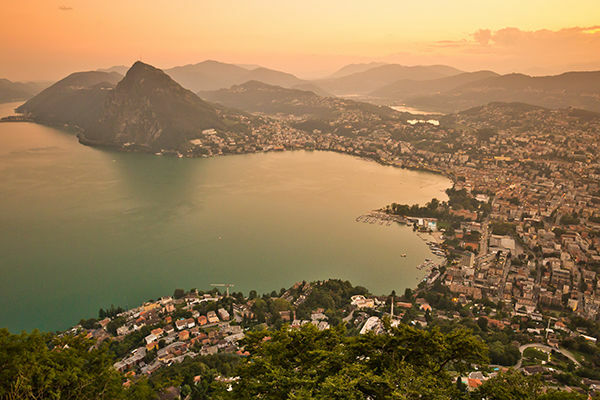 Lugano, the leading city of the Italian-speaking Swiss canton of Ticino, gives you Switzerland with an Italian accent. The town (population 60,000; metropolitan area jumps to 140,000) sprawls luxuriously along the shores of Lake Lugano. 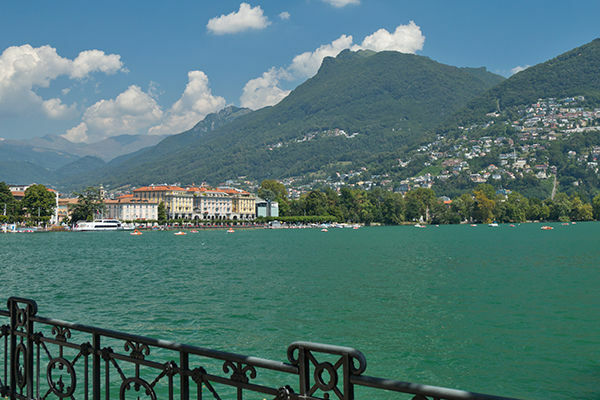 Just a short, scenic train ride over the Alps from the German and French regions of Switzerland, Lugano has a splashy, zesty, Mediterranean ambience. It attracts vacationers from the rainy north with its sunshine, lush vegetation, inviting lake, and shopping. While many travelers come here for the fancy boutiques, others make this a base for hiking, cruising the lake, and passing lazy afternoons in its many gardens. Its mountains aren't mighty, its beaches are lousy, the cityscape is nothing thrilling, and it can all feel a little geriatric, but Lugano is the best spot to enjoy palm trees in Switzerland, and its charm merits at least a short visit. Lugano lies conveniently at the intersection of the Gotthard Panorama and the Bernina Express — two of Switzerland's more scenic train rides. 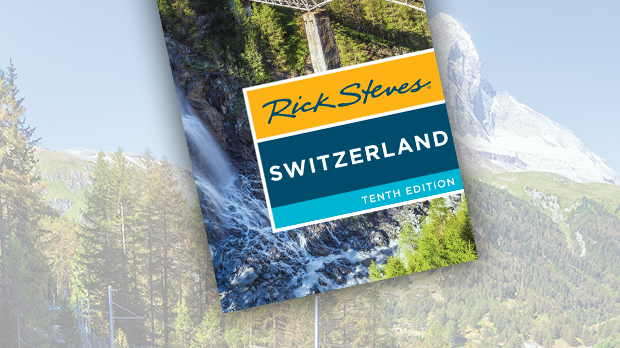 Blitz sightseers arrive along the Gotthard Panorama route one day and take off on the Bernina Express the next. If relaxing is on your itinerary, spend two nights and a full day here, arriving and departing on the scenic trains. With a day, spend the morning exploring the old town with my self-guided walk (below), then do a boat cruise and ascend a mountain lift (San Salvatore is best) in the afternoon. Extra time — and you'll have some — can be spent relaxing in gardens and along the lakefront. The old town is on Lake Lugano, which is bordered by promenades and parks. A funicular connects the old town with the train station above. Nearly everything in this article (with the exception of the mountain lifts) is within a five-minute walk of the base of the funicular. The town of Lugano fades into other, smaller waterfront communities all around the lake (much of which lies in Italy). Italian is the language of Lugano and its region (Ticino), which is surrounded on three sides by Italy. In this corner of Switzerland, a Strasse (street) becomes a Via, and a Platz (square) becomes a Piazza. Lugano's tourist information office is in the town hall building, facing the boat dock (tel. +41 (0)58-866-6600). There's also a branch at the train station. The tourist information office offers different excursions, such as to the fishing village of Gandria; to the top of San Salvatore; and to the top of Monte Brè, including a short boat ride (all tours well described on the website). Tours are given in two languages at the same time (usually Italian and English), and depending on who signs up, may lean much more heavily toward one or the other. The train station is on a hill above downtown. It has lockers (in the underground passage), WCs, a ticket office, ATMs, a convenient small grocery (Piccobello, open long hours daily), a surprisingly genteel restaurant (Buffet della Stazione, with affordable pizzas), and a branch tourist information office. The easiest way to get to the town below is by funicular (look for funicolare per il centro sign — it's by track 1 in the middle of the station, departs every 5 minutes, daily 5:00–24:00, 1.30 CHF, free with Swiss Travel Pass). The funicular deposits you right in the heart of the old town, at Piazza Cioccaro. You can also walk (but not with wheeled luggage) or take bus #2 or #4 down the hill (for bus details, see "Getting Around Lugano," below). Wi-Fi: The city operates free Wi-Fi along the waterfront and in Piazza della Riforma (look for the Wi-Fi Lugano network). To log in, you’ll need a mobile phone that can receive texts. Laundry: Il Girasole is a self-service launderette with English instructions a 15-minute walk away from the lake — or take bus #7 (direction: Pregassona) three stops from Lugano Centro to Piazza Molino Nuovo, then walk a block onwards (open 7:00–22:00 daily, Via Giuseppe Bagutti 8, tel. 091-922-9900 or mobile 076-503-7964). Local Guide: Lovely Christa Branchi teaches enthusiastically about her city and its history (180 CHF/1–3 hours, 220 CHF/half-day, 330 CHF/day, tel. 091-606-3302, christabranchi@hotmail.com). The town center is easily walkable, and the two nearby hilltop excursions, San Salvatore and Monte Brè, start from funicular stations that are each a 20-minute lakeside stroll (in opposite directions) away from the center. Buses can save time, though. All lines converge at the Lugano Centro terminal on the north edge of downtown. Bus #2 (2–4/hour) conveniently links the Paradiso neighborhood (for San Salvatore), the train station, Lugano Centro, Cassarate (for Monte Brè) and Castagnola (where the path to Gandria starts). Buy bus tickets from the English-speaking touch-screen machines next to any bus stop (2-CHF "short-distance" ticket good for up to four stops, 2.50-CHF regular "Area 100" ticket valid for one hour, 7.50-CHF day pass — to buy, touch "Further Tickets," then "Day Pass," then select "Lugano"; all Lugano buses covered by Swiss Travel Pass). Resorty Lugano hides some interesting history, but let's face it: You're here to relax. Consider taking this short self-guided stroll to get yourself oriented...or just grab a gelato and wind your own way through the city center's arcades and lakeside promenade. Start on Piazza Cioccaro, at the base of the funicular that connects the train station with the town center. With your back to the funicular, go down the narrow street to the right of the building at the bottom of the square. Via Pessina: In this tangled, colorful little corner are several small delicatessen-type shops run by Signor Gabbani. Stop in if you'd like to sample some of the best local cheese, bread, salami, and/or wine. Grand Café al Porto: This venerable, elegant institution is the most historic café in town. The 1803 above the fireplace is the date it opened — and also when Ticino joined the Swiss Federation. Once a convent (notice the fine sgraffito facade), the café evokes the 19th-century days when Giuseppe Mazzini and fellow Italian patriots would huddle here — safely over the border — planning their next move to unify Italy. Much later, as World War II wound down, US intelligence officer Allen Dulles (future head of the CIA) met right here with Nazi and Italian representatives to organize a graceful end to the war and prevent the Germans from ruining Italy with a scorched-earth retreat. And in more carefree times, this is where Clark Gable and Sophia Loren dipped cookies in their coffee. Piazza della Riforma: This square is Lugano's living room. With geraniums cascading on all sides, the square hosts an open-air cinema, markets (Tue and Fri mornings), and local festivals. The giant yellow building is the city hall (municipio). Via Canova: This street leads directly to the city park. Follow it for a few blocks, watching for the elegant gallery that burrows through a block (on your left after the second crosswalk). Just after that, on your right, you'll pass the Palazzo Reali, which displays ever-changing exhibits of primarily 19th- and 20th-century art (may be closed for renovation when you visit, main collection-8 CHF, covered by Swiss Travel Pass, Wed–Sun 10:00–17:00, Tue 14:00–17:00, closed Mon, Via Canova 10, tel. +41 (0)91-815-7971). Next is the creamy little Church of San Rocco. Its rich frescoes celebrate the saint responsible for protecting the city against the plague. Beyond the Church of San Rocco is the park-like Piazza Indipendenza. The giant head on its side is the work of Polish sculptor Igor Mitoraj, who has decorated squares all over Europe with similar sculptures. On your right is the vast, sterile casino building. Though its blocky, modern style doesn't quite fit the otherwise elegant architecture of this area, it does have an elevator leading up to a fine lake view (lake side of building — we'll pass there later on this walk). City Park (Parco Civico Villa Ciani): The park's centerpiece, the Villa Ciani, houses a fine-arts museum. Sprawling from here along the lake is a lush park filled with modern art and exotic trees from around the world. Its water gate evokes the 19th century, when this was the private domain of aristocrats. The flower beds are organized to show off maximum color all year long. If the weather's nice, explore this ingeniously landscaped, people-friendly space (and remember – you're on vacation). It's lit at night and particularly good for a late, romantic stroll. Waterfront: This lovely promenade gets even nicer on Friday and Saturday evenings from late June through August (after 20:30), when the busy street is closed off to traffic and you'll find concerts and events in full swing. On the right, the casino's top-floor restaurant overlooks the lake. If it's open, ride the glass elevatore up and down for a fun and free view. Then continue strolling through the arcade or under the mulberry trees (a favorite of silk worms, dating from the time when silk was a local industry) until you reach the tourist information office and the boat dock. On the way, you'll pass several places to rent paddleboats. Look across the lake for the village clustered around a huge, blocky, sand-colored building (lit up in bright colors at night). That's the Casinò di Campione, the largest casino in Europe, which enjoys special legal privileges, granted by Mussolini when he saw what casino tourism had done for nearby Lugano. The casino dominates Campione d'Italia — a tiny enclave of Italy that's surrounded by Switzerland on all sides; residents use Swiss francs, have Swiss phone numbers and license plates, and pay Swiss taxes...but carry Italian passports. Via Nassa: This is one of Lugano's main shopping streets. For the next several blocks, just enjoy the wandering, window-shopping, and people-watching along this gauntlet of boutiques and jewelry shops under typical Lombardi arcades. On the right, at #22, the Co-op department store has a good selection of chocolates (just inside the door on the left), a basement supermarket, and a handy top-floor cafeteria with great views. Church of St. Mary of the Angels (Chiesa Santa Maria degli Angioli): This lakefront church, which dates from 1499, was part of a monastery (next door). Inside the church are the city's best frescoes. The Passion and Crucifixion of Christ, the artistic highlight of all Ticino and the finest Renaissance fresco in Switzerland, is on the wall that separates the nave from the altar area. Milanese Bernardino Luini, who painted it in 1529, is sometimes called the "Raphael of the North" for the gentle expressions and calm beauty of his art. Follow the action as the scenes from Christ's passion are played out, from Jesus being crowned with thorns (left) to the doubting apostle Thomas touching Jesus' wound after his Resurrection (right). The central dominating theme is the Crucifixion. The work is rife with symbolism. For instance, at the base of the cross, notice the skull and femur of Adam, as well as his rib (from which Eve was created). Worshippers saw this and remembered that without Adam and Eve's first sin, none of the terrible action in the rest of the fresco would have been necessary. Luini spent a decade working on this fresco, applying his paints day by day, a section at a time, over thin layers of wet plaster. Facing the giant fresco, look to your left to find the three smaller frames. This is Luini’s Last Supper, which was sliced off a wall of the monks’ dining hall and put on canvas to be hung here. Finally, wander up to the front of the church. The altar is rich and unusual with its wooden inlay work. Giardino Belvedere: This delightful little garden park is an open-air modern-art museum. The building facing it was once a monastery, then the Grand Hotel Palace. This first grand hotel on the lake was radical in that it actually faced the lake. From here, survey the scene. Paradiso, the big hotel zone with its 80-foot-high fountain, is a 15-minute walk along the lakeside. From there, the San Salvatore lift (described next) zips sightseers to the summit. The ridge across the lake marks the border of Italy. Our walk is finished. If you've got energy left, continue along the lakefront on the pleasant path to Paradiso; there you can summit San Salvatore, hop on a lake cruise, or do both. Two handsome mountains (San Salvatore and Monte Brè) flank Lugano’s city center, and you can conquer either one, sweat-free, by lifts. At about 3,000 feet, Lake Lugano’s mountains are unimpressive compared with the mightier Alps farther north; if you’ve done some of the higher lifts in the Berner Oberland or Zermatt regions, nothing here will thrill you. Still, the commanding mountaintop views over the lake are enjoyable. Doing more than one is overkill; San Salvatore is best and relatively handy to Lugano town. Monte Generoso is a higher mountain that’s a little farther from town. The easiest and most rewarding peak on the lake, thanks to its fine panoramic views, San Salvatore (2,990 feet) rockets up from the Lugano suburb of Paradiso. At the top you'll find good viewpoints, as well as a playground, a self-serve cafeteria, and a restaurant (overpriced, but may offer a daily special-plus-funicular deal, food served 11:00–15:00, in high season also 19:00–23:00). From the lift, be sure to climb five more minutes to the actual summit. On the way up, pop into the Salvatore Museum, with its small collection of religious art and exhibits on local geology (included in funicular ticket, Wed–Sun 10:00–12:00 & 13:00–15:00, closed Mon–Tue). At the top of the mountain, there's a small church surrounded by a view terrace. For the best panorama, climb to the rooftop of the church (entrance around the right side) for a sweeping, nearly 360-degree view. Unfortunately, the bay directly in front of Lugano is just about the only thing you can't see from up here. Cost and Hours: 30 CHF round-trip, half-price with Swiss Travel Pass, 2/hour – departs on the hour and the half-hour, 12-minute ride, transfer to another funicular midway up; lift runs daily mid-July–mid-Aug 9:00–23:00; rest of year 9:00-18:00, Fri-Sat until 22:30, closed Nov-mid-March; these are last-ascent times – last descent generally 30 minutes later; tel. +41 (0)91-985-2828. Getting There: To reach the base of the funicular, either walk along the water (about 20 minutes south of the city center; keep your eye out for brown funicolare signs), or take bus #2 (direction: Paradiso, get off at Paradiso/Geretta stop, rather than staying on until the Funicolare San Salvatore stop). Departing from the other end of Lugano, in the suburb of Cassarate, this funicular takes you to arguably the best view down on the lagoon of Lugano itself (3,005 feet). There’s a restaurant up top. Cost and Hours: 25 CHF round-trip, half-price with Swiss Travel Pass, 2/hour — generally at 0:15 and 0:45 after the hour, 33-minute trip; lift runs daily June–Oct 9:10–18:45 plus July–Aug Fri–Sat until 23:05, off-season until 16:45, closed Jan–Feb; these are last ascent times — last descent generally 30 minutes later, restaurant has lunch-and-funicular combo offer, tel. +41 (0)91-971-3171. Getting There: From Lugano’s old town, you can take bus #2 (direction: Castagnola) to the Cassarate/Monte Brè stop. Getting off the bus, walk a little farther along the water, then follow brown funicolare signs uphill to the left. Don’t dawdle — the turnstile gate closes with little warning shortly before the funicular departs. You can also reach Cassarate via the lake boat from downtown Lugano. The tallest mountain but farthest from Lugano, Monte Generoso (5,590 feet) is high enough that you can see some of the more distant cut-glass peaks. A cogwheel train climbs up from the station at Capolago (at the south end of Lake Lugano) in 35 minutes, leaving you at Generoso Vetta, a 10-minute walk below the summit. Cost and Hours: 54 CHF round-trip, half-price with Swiss Travel Pass, June-Sept roughly hourly 9:05-16:35, off-season until 15:35, few or no trains Nov-March, tel. 091-630-5111). Getting There: From Lugano, you'll take the train (15 minutes) or a once-daily, slower boat to Capolago. Lake Lugano is made to order for a boat trip. The lake boats serve as regular public transport to a couple of car-free spots on the lake. You can either ride the boat around the lake or hop on and off the boat to explore. 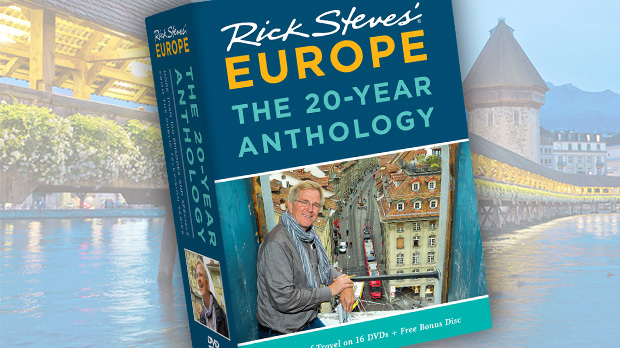 There’s also a dizzying array of more elaborate excursions to choose from (such as a lunch trip, a grand tour, a shopping excursion into Italy, and an evening dinner cruise). One-Hour Loop Trip: The basic one-hour boat cruise does a loop from Lugano. It stops at a few desolate restaurants and hamlets along the far side of the lake, visits Gandria (a peaceful and picturesque little fishing town with several romantic view restaurants), then returns to Lugano (27.40 CHF round-trip including stopovers, 16.60 CHF for one segment, free with Swiss Travel Pass). You can get off at any point, look around, and wait for a later boat; from Gandria (see below), you can also return to Lugano by foot or bus. Note that if you’re hopping on and off the boat, you’ll actually cobble together the trip from various longer cruises, each with different itineraries. Some circle the lake clockwise, others counterclockwise, and not every boat makes every stop (the boat serves only those parts of the lake within Swiss borders). Pick up the boat schedule (orario) or find it online. Study it carefully to note when the next boat comes and exactly where it stops. The schedule can be confusing, so ask at the tourist information office or one of the boat docks if you need planning help. Stops on the Lake: On the far side of the lake, the best place to break your journey is at the adjacent stops of Cantine di Gandria and Museo Doganale, which are a quick walk from each other (boats dock at just one of these stops, not both). Cantine di Gandria has two traditional trattorias and wine grottos — great for a rustic meal or just a snack and a drink (daily 11:30–21:00, closed Oct–April, Grotto Teresa: tel. +41 (0)91-923-5895, Grotto Descanso: tel. +41 (0)91-922-8071). A five-minute walk from Cantine di Gandria takes you to the bright orange Museo Doganale, right on the Italian border, with underwhelming exhibits on customs and smuggling (3 CHF, no English but worth a quick visit, daily 13:30–17:30, closed mid-Oct–March, tel. +41 (0)79-512-9907). Gandria, on the Lugano side of the lake, is the most popular stop. A dense cluster of houses hangs over the lake with a few lazy, romantic hotels and several inviting restaurants. The only “streets” are stairways and cool, narrow passageways between the lake below and the road above. Either of the two restaurants by the boat dock will do for a meal or drink (Ristorante Roccabella: tel. +41 (0)91-971-2722; and just up the stairs, Ristorante Antico: tel. +41 (0)91-971-4871). But it’s worth seeking out Locanda Gandriesi, deeper into the village, which has better food and a smaller, quieter terrace (pasta and polenta dishes, open daily — even in winter; go left from the dock — it’s about a 5-minute walk, just below the church; tel. (0)91-971-4181). From Gandria, you can walk back to Lugano along a great 45-minute lakeside path through restored olive groves, with multilingual signposts telling you all about olive cultivation (follow signs for Sentiero dell'Olivo). This path brings you to Castagnola, a suburb of Lugano; at the Castagnola post office, catch bus #2, #11, or #12 back into Lugano (or walk another 30 minutes). Note that the last boat of the day from Gandria back to Lugano leaves at 17:20 (or 18:35 in July–Aug). There are also buses (#490, Mon–Sat only), but the last one leaves at 18:25. If you stay longer and miss the boat and bus, you'll have to walk or fork over 40–50 CHF for a taxi. 14:55 Catch the boat from Lugano around the lake to Gandria (arrival at 15:40) and have a drink and appetizer at Miralago Gandria — early diners always get lakeside tables. 17:00 Catch the last boat from Gandria and ride to Paradiso. Once at Paradiso, walk to the San Salvatore lift, ride the lift to the summit of the mountain (beautiful at twilight), ride back down, and walk along the lake from Paradiso back to Lugano. On a rainy (or sweltering) day, a visit to this factory in Caslano, a small town near Lugano, makes a fun excursion (though it may be closed for renovation during your visit – call before you go). Alprose is one of Switzerland’s smaller, less-well-known chocolate producers, but their factory is geared up for visitors and generous with free samples. The machines are in operation Monday to Friday from 9:00 to 15:00, but you’re always allowed a look at the factory. An elevated, enclosed, air-conditioned walkway lets you watch as big dollops of chocolate are dropped into plastic molds, cooled and popped out onto a conveyor belt, wrapped (mechanically), and packed (manually) into boxes. Next to the factory, a modest museum is set up in a tent. A 15-minute film describing the chocolate-making process runs continuously (ask for the English soundtrack). The shop sells fresh factory seconds for a reduced price. Picnickers can sit at tables next to a vending machine with drinks. Cost and Hours: 3 CHF, no Swiss Travel Pass discount, Mon–Fri 9:00–17:30, Sat–Sun until 16:30, shop stays open a half-hour longer, Via Rompada 36, Caslano, tel. +41 (0)91-611-8856. Getting There: The S60 suburban train runs from Lugano to Caslano (Mon–Fri 4/hour, Sat–Sun 2/hour, 20 minutes, direction: Ponte Tresa, covered by rail passes). The train leaves from the cute yellow antique train station across the street from Lugano’s main station (marked Ferrovie Luganesi; go down the stairs). Machines and windows sell tickets (13.20-CHF day pass covers your return). From Caslano station, cross the tracks and go one block downhill along Via Stazione, then turn right on Via Rompada (passing Museo del Cioccolato signs) a long block and a half to the factory. Lugano’s history is tied to its strategic position: where the Italian world is pressed up against the Alps, and just below the most convenient alpine passes. The Celts crossed the Alps here and left their mark. The ancient Romans were here, too — the oldest sacred building in Switzerland is an early Christian baptistery on this lake. In 1220, when the first road over the Gotthard Pass was built, the Swiss took an interest in acquiring the Italian-speaking region of Ticino, leading to a three-century-long battle for control. Several castles in the nearby town of Bellinzona recall a pivotal Swiss victory in 1513. With this success, the Swiss gained a toehold south of the Alps. At first, Ticino was ruled from farther north, as a sort of colony. But in 1798, after French troops invaded Switzerland and proclaimed the Helvetic Republic, Ticino stood up to Napoleon by creating an independent Republic of Ticino. The Ticinese couldn’t rule themselves peacefully, though, and five years later (in 1803) they joined the reestablished Swiss Federation as a regular canton, on the same footing as the rest of Switzerland. In the 19th century, Lugano — Italian-speaking, just a short trip from Milan, yet safely over the border in Switzerland — provided a refuge and staging ground for intellectual Italian revolutionaries. They’d meet here to plan the Risorgimento, the struggle for Italian unification (c. 1840–1869). Later in the 19th century, tourism arrived, and the grand lakefront hotels were built. Today, Lugano is second among Swiss cities only to Zürich in its number of banks. It’s easy for Italians and others with suitcases of hard cash — black money — to swing by and take advantage of the secret bank accounts. But the mentality here remains Italian. Rather than the Zürich model (“live to work”), the people of Lugano brag that they work to live.